Shop4teams offers a fantastic variety of in-stock Girls' Basketball Uniforms, Basketball Jerseys and Basketball Shorts from the brands you love like from Teamwork Athletic Apparel, Holloway, Augusta Sportswear and High Five. All our blank in-stock uniforms are available to ship same day if ordered by 12:00 CST. time. 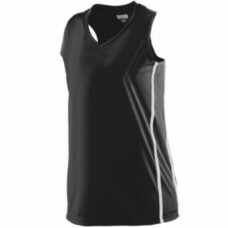 We offer great team discounted prices on basketball uniforms from a variety of reputable brands. We offer even lower prices when buying in larger quantities for leagues. You can choose to purchase blank uniforms, or have them customized with your team name and logo, and player names and numbers. Our wide selection and guaranteed lowest prices help make us the #1 online store to purchase your team basketball uniforms. Size chart 100% polyester wicking knit * 92% polyester/8% spandex pinhole mesh side inserts *.. Size chart 100% polyester wicking knit. 100% polyester printed wicking knit side panel. W.. Size chart Dry-Excel Fresh Micro-Interlock, polyester knit with wicking and odor resistant prop.. Size chart 100% polyester wicking mesh. Wicks moisture away from the body. Girls fit. Heat Seal.. Size chart 100% polyester wicking mesh. Wicks moisture away from the body. Ladies fit. Heat sea..